This 6-string instrument was commissioned in 2006 by a professor who teaches at a university in the northwest. The instrument is used for recording and for live music and dance performances, among other projects. 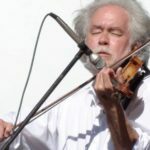 As with all the instruments I make, the player and I worked together on the design of the instrument, including the number of strings the instrument was to have, its shape and whether the instrument would have a more standard pegbox or an electric guitar headstock. The wood for the body of the instrument was from a selection of Curly Maple that another luthier friend had which had been drying for a number of years. The player and I went to Corvallis, Oregon, and looked at the available stock, and the player selected the piece that this instrument would be made from. I very much like the “tear-drop” shape of this instrument. 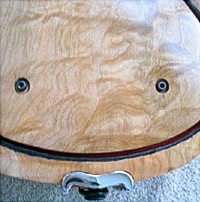 The complex grain of the Curly Maple, in combination with the player’s choice of Cocobolo wood for the tailpiece, chin rest and nut of the instrument resulted in an instrument that stands out in a room even without being played. The red of the Cocobolo and the light-colored Curly Maple are an unusual, though dynamic mix of two very different woods. I applied a clear lacquer finish to both the Curly Maple of the body of the instrument and the Cocobolo fittings, which were made by hand, to accentuate the natural color and figure of the woods. 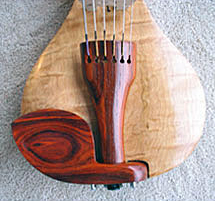 The back of the instrument was routed out to reduce the overall weight of the instrument, and I applied a red-dyed leather strip to the edge of the rounded triangular lid to compliment the Cocobolo wood. The bridge used is a Barbera “Twin-Hybrid” 6-string bridge, featuring two piezo pickups for each string. The fingerboard for this instrument was hand-made. The player asked that this instrument have the same scale-length as that of his 16 inch body-length viola, so I took measurements from that instrument before doing the pencil drawings and making the templates to construct this instrument. 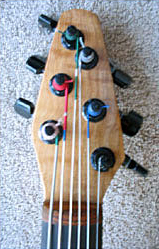 The headstock of the instrument uses guitar tuning machines which I set at an unorthodox angle so that the instrument had a unique look. There are some instruments I’ve made that, when the time comes to give them to the player who commissioned them, I wish that I had made the instrument for myself. This is, indeed, one of those instruments.